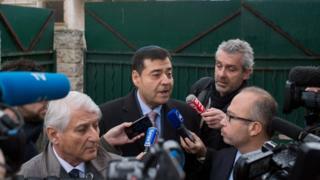 Image caption Marseille's Israelite Consistory president Zvi Ammar (centre) spoke to journalists after a Jewish teacher was attacked by a teenager wielding a machete. The main Jewish leader in the French city of Marseille has urged men to stop wearing the skullcap after a violent, anti-Semitic attack on a teacher. Zvi Ammar, head of Marseille's Israelite Consistory, said the "exceptional measure" was needed to protect Jewish lives. However, France's chief rabbi urged Jews to keep covering their heads. The teacher was stabbed by a boy who reportedly said he had done it for the jihadist Islamic State (IS) group. Monday's machete attack left the teacher, Benjamin Amsellem, who was wearing a skullcap at the time, with an injured shoulder and hand. Militants said to be from IS killed 130 people in attacks in the capital Paris less than two months ago. Speaking to La Provence newspaper (in French), Mr Ammar called on Jews "not to wear the kippah [skullcap] in the street to avoid being identified as Jewish". "It is sad to find ourselves in this position in 2016, in a great democratic country like France," he said. "But faced with an exceptional situation, we have to take exceptional measures. It causes me such pain to come to this conclusion but I do not want anyone to die in Marseille because they had a kippah on their head." Mr Ammar, the head of Marseille's Israeli Consistory, the top Jewish governing body, said he knew his comments would anger some Jews, but "nothing is more important" than protecting human lives. He told French media on Tuesday he was asking Jews to go without the skullcap "until better days". However, France's chief rabbi, Haim Korsia, urged Jews in Marseille not to follow such advice. "We should not give in to anything, we will continue to wear the kippah," he said, stressing that Jews and the skullcap were not responsible for the violence. A 15-year-old Turkish Kurd was arrested after attacking Mr Amsellem, 35, in a Marseille street in broad daylight. The teacher's lawyer, Fabrice Labi, said his client had told him: "I had the feeling [the attacker] wanted to decapitate me." Speaking briefly to reporters on Tuesday, Mr Amsellem said the experience had been "unimaginably difficult". Interior Minister Bernard Cazeneuve earlier called the latest attack a "revolting anti-Semitic aggression" while French President Francois Hollande later said such acts were "unspeakable and unjustifiable". Jewish men often wear a skullcap, also known in Hebrew as kippah or in Yiddish as yarmulke, as an outward sign of their religion. The latest stabbing in Marseille came just days after France held memorial events for those killed in the Paris attacks last January. Four Jewish shoppers were killed by an IS supporter at a kosher supermarket, shortly after the deadly assault on the office of Charlie Hebdo magazine. Since then, more than 700 synagogues, Jewish schools and community centres have been protected by police or soldiers.